​A Magical Summer Experience, Truly a Fairy Tale! A 5 acre eco-friendly farm where children learn sustainable living, working hands on with our farm animals. Campers discover through nature, science, art and baking. Different ages work together, benefiting from the opportunity to practice cooperative work and play skills while leading and nurturing, increasing confidence and independence. Others are exposed to more complex play, advanced language and education activities by observing and imitating. A spirit of cooperation and caring nurtures an environment where children help each other and learn from one another. We create in our art studio, taking "typical trash" such as a paper towel roll and turn it into amazing, fun projects. We give our lunch left overs to the chickens or place it in our compost to later use in our garden. The chickens return the favor and leave us fresh eggs each day that we collect with our baskets and later use in our kitchen baking delicious, organic goodies. We compost and plant in our organic garden, watch it grow & harvest. On hot days we cool off having fun in our sprinklers, kiddie pools and slip & slides. Campers thrive in a nurturing atmosphere, playing with familiar friends, while making new buddies and memories. 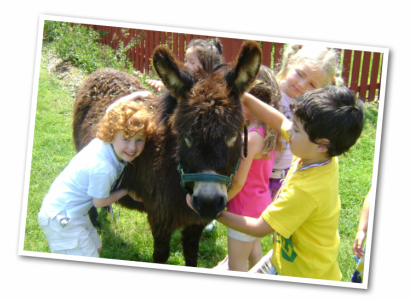 Our furry friends include our pony, donkey, horses, chickens, pigs, goats, sheep and bunnies. We have daily contact with our animals by feeding, grooming and/or riding. ​A week at camp includes: farm time, pony rides, gardening, science, nature, baking, water play, sports, art, music, story time, outdoor play and fun weekly themes. Limited space for only 16 lucky campers! An exclusive farm experience that only exists at The Green School! Campers must be fully separated & potty trained! Lunch: Parents provide a nut free lunch Monday - Thursday, we provide an organic snack. Free Lunch Friday: We serve pizza for lunch to all campers on Friday. *If your child is a picky eater or has dietary restrictions, you are welcome to send a lunch. We offer this convenience to help make your Fridays a little easier.